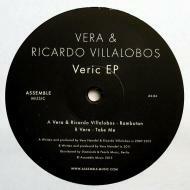 The Veric EP is the highly-anticipated fruit of an extended collaboration between Vera Heindel and another member of the extended Robert Johnson family, Ricardo Villalobos, who has frequently shared the decks with her back at her home club in Frankfurt, as well as further afield in Berlin, Ibiza and beyond. Their paths have also crossed via Perlon Records, on which Vera has released under her Mara Trax name with Maayan Nidam, another Assemble Music luminary. On ‘Rambutan’, Vera and Ricardo’s combined sense of precision, clockwork rhythmic sensibilities and devotion to the spaces between sounds are present in every detail, and will be met with rapture by fans of early 00s organic minimal house music (think Ben Nevile for reference). It’s been five years in the making, and worth every minute. With ‘Take Me’ Vera takes full charge and turns up the funk: it’s one big come on, spinning you round and giving you a squeeze. The pitch-bent bassline drives forwards while insistent vocal samples give way to sirens and minor synths. It’s a futuristic turn for Assemble Music and displays to the full the label’s open-minded and forward-looking approach. Don’t miss.